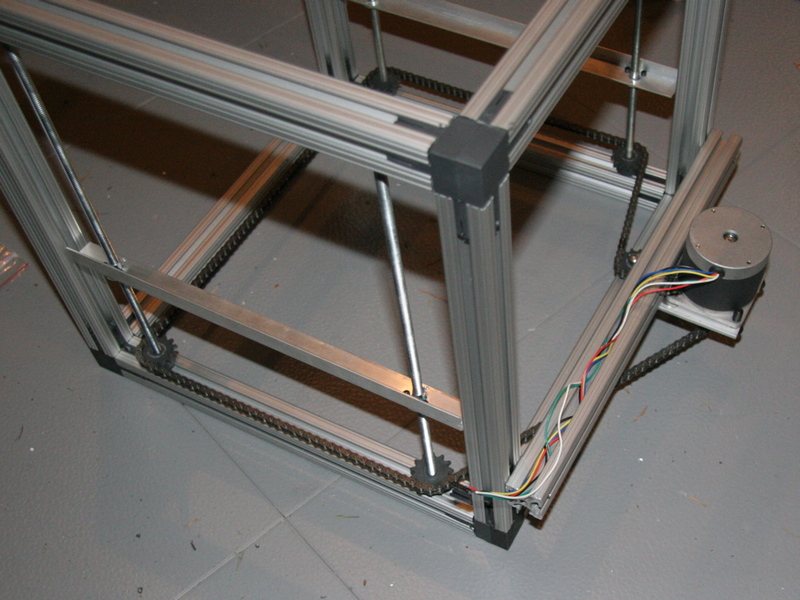 Shortly after building the Z axis, I began working on the Y Axis. I was being cheap and wanted to attempt to use a single drive screw instead of two (as planned) thinking that the 80/20 would be true enough to prevent racking. Once I actually hooked up the cross beam I found the racking to be pretty extreme. To counter this, I needed another drive screw and a timing chain instead of direct linkage; This meant another order from electric gold mine. I had decided to use chain instead of a timing belt for cost reasons. I may revisit this in V2 as it adds quite a bit of weight and is really loud. I should be able to get the Y Axis built this week and the X axis shortly after that. I had some problems attempting to use a screw to feed plastic into the extruder. I tested a feed mechanism which uses two pulleys and was impressed with the results. In order to get a screw to engage the plastic quite a bit of side pressure is needed, which in turn requires quite a bit of torque to drive the screw. With the dual pulleys, a smaller stepper motor can be used because very little pressure is needed, which means less torque is needed for the same extrusion feed pressure.I was attempting to work with Clayborn Labs to design a heater barrel. I need to follow up with them because my account seems to have gone into the ether… In the mean time, I’m going to be working with the electric gold mine “NASA heat tape”. Smoke test passes! No smoke is passing right? I ran some simple tests designed to test each motor controller. I used LEDs instead of a motors because I didn’t want to risk destroying them. It was wild to see the coil animation represented by lights. Next up is testing the end stops and building an on-board gcode interpeter. 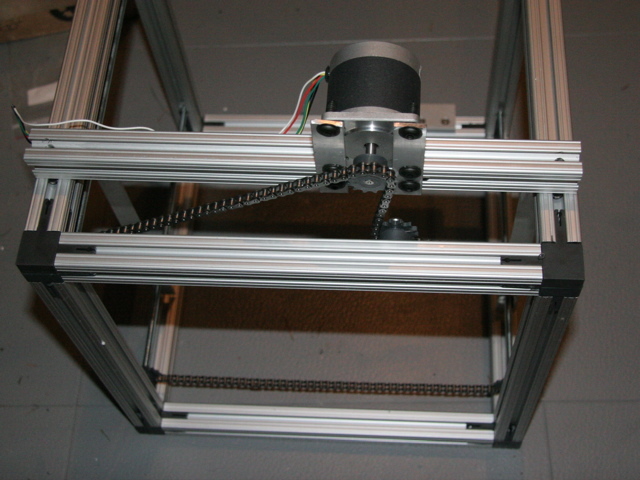 I am building a 3D printer, a sister project to the self replicating printer project RepRap. A 3D printer is capable of building usable objects, such as toys, by ‘drawing’ one layer at a time, until the whole object has been constructed. While researching plastics for this printer I came across a dilemma – Which is better Bioplastic or Petroleum based plastic? Bioplastics are derived from corn or potato starches. ‘Petroplastics’ on the other hand is derived from crude oil. One of the goals of mine is to develop an 3D printer ecosystem which enables the direct recycling of plastic – thus keeping plastic out of the land fills. Until this ecosystem is complete, I will need virgin material to work with. So the question remains – Which is “better”? What is the environmental impact of the production or extraction of the base material for the resin? How readily available are the resources needed to produce the resin? How does the use of those resources for the production of resin affect the use of those resources for other means? How long does the resin take to be reduced to base organic materials? Petroplastic is derived from crude oil. During the refining process, hydrocarbons are extracted from the oil to produce various everyday chemicals – octane is extracted and refined to produce auto fuel, nonane and hexadecane to produce diesel, kerosene, which are used in making jet fuel. In fact, Wikipedia lists dozens of chemicals which are used in most of the products that industrial societies have become dependent on – petroplastic is just one product derived from it. Millions of years ago, places which currently have abundent reserves of oil or natural gas were lush rain forests with rich healthy ecosystems. The surface of the earth has changed via plate tectonics – which is why oil has been found in places like the Arctic or underwater. As plants and animals die, they decompose by natural processes – by other animals, insects and eventually microbes. The raw material is used in a successive generation to form the building blocks of plants which animals eat and so on. If this process is interrupted, either by a change in climate or other catastrophic event, the organic material will eventually end up in underground reservoirs. Heat and pressure causes these compounds to combine into different types hydrocarbon chains. The variance in temperature, porosity, and pressure in these reservoirs determines how it achieved the state we see today – Oil Shale exists where rock is very porous; areas of high heat and pressure have abundent natural gas; and somewhere in between is where “sweet crude” exists. The energy density of oil is about 40 to 1 – a simple example is it takes 1 gallon of gas to extract 40 gallons of gas. This fact is why oil is so attractive as an energy source. Thermoplastic is not one thing – there are many different types of thermoplastics for lots of different uses: High Density polyethylene (HDPE), Low density polyethylene (LDPE), Acrylonitrile butadiene styrene (ABS), Polyethylene terephthalate (PETE), Polytetrafluoroethylene (PTFE), Polyvinyl chloride (PVC) – just to name a few. Plastics also have additives which adjust their properties – some making them shatterproof with Bisphenol-A, some stabilizing the resin with lead or cadmium. Bioplastic is derived from plant starches, usually corn or potato. The endosperm of corn, the center white in the kernel, contains the starch which is extracted by soaking, grinding and washing. This is then combined with plasticizers (sorbitol & glycerine in varying amounts) to produce a thermoplastic. When harvested, the left over material (husks, ears, stalks) are composted and returned to the soil and supplemented with fertilizers. It has been difficult to find information about the inputs to corn growing for the production of bioplastic; I’ve started looking into information about ethanol production. According to T.W. Patzek at Berkley, siting several studies averages the net energy production at +280 BTU. I’m intrigued by one study which also includes the energy consumption of farm equipment which concludes a net negative energy output of 33,000 BTUs! This means it takes much more energy to produce a unit of ethanol than the ethanol can provide to cars. Farm technology is currently fossil fuel based – from the fertilizers used to enrich soil, to the farm equipment used to prepare the soil and harvest the plants, to the machines that post process the plant material into plastic. As mentioned before, oil was formed after millions of years in ideal conditions; trapped in underground fissures. But how much exists? 1. Oil is not an infinite resource. 2. Remaining supplies of oil should be used wisely. 3. Alternative sources of energy need to be brought on line soon. Civic Actions has a neat visualization of the remaining world oil. Conversely, corn requires clean water, fertilizer and harvesting equipment all which require oil today. As oil becomes more scarce, corn production will become difficult if not impossible – unless alternative production techniques can be implemented. Plastics resin is a byproduct of oil – its production has little impact on other uses of oil. Does the production of bioplastic have an impact on corn or potato for consumption or feed stock? Using the ethanol analogy, it may have minimal impact. According to the renewable fuels association concerns about the impact on food are unfounded. In fact the correlation between food costs had more about scarcity of oil rather than its use in biofuels and bioplastic. It appears that much of the land devoted to oil alternatives were unused until recently. Petroplastic ‘photodegrades’ in sunlight. The ultraviolet light from the sun causes polymer chains to become brittle and crack under stress. Unfortunately, natural microbes responsible for natural decomposition do not recognize these polymer chains as food. Work is under way to engineer microbes which consume plastic (green goo?). A company in the UK called “d2w” has a product which enables plastic to degrade without sunlight. Without details, I presume that the plastic does not degrade to base organic compounds – it works by making polymer chains brittle without ultraviolet light. Simply put – petroplastic will not decompose or compost – it simply breaks apart into smaller plastic pieces which are unusable to life as we know it. UPDATE: June 2009 – This statement may not be true. Apparently a two students have bread a microorganism which can consume plastic (via mnn). I will follow this closely. Bioplastic, being polymers of glucose (specifically amylose and amylopectin) are considered food by decomposing microorganisms – no special magic or unnatural remedies required. Which is better – bioplastic or petroplastic? Given how much oil is used in the production of the crops used to make it would appear that petroplastics are ‘better’ than bioplastics. As technologies are developed to replace oil in farming equipment and transportation, bioplastics will soon eclipse petroplastics as the environmentally sound choice. I for one will support the development of Bioplastics. PSM is definitely price competitive to petroleum based resin, and in some cases less costly. The strength may be suitable for some applications and not suitable for others. Not all petroleum plastics are “strong enough” for all applications either. In most landfills, NOTHING degrades, not newspapers, not banana peels, and not PSM. Therefore, if it does not degrade, it will not release anything. Conversely, if it does degrade, it will not release any more gasses than food waste such as a corn cob. Unlike other biopolymers, PSM does not use corn intended for “people food”. Our stock is made specifically for PSM and is not affected, nor will affect, the global corn prices. The additives on the market that can be mixed in with petroleum plastics to make them “degradable” are beneficial in extremely limited applications. In short, they break-apart (degrade) the product, but the plastic particles are still present. For example, the physical “bag” may be gone, but your lawn is now infused with plastic particles which will take tens of thousands of years to degrade or be eaten by animals and harm them. In many ways, it is harder to clean up the particles than the bags and bottles if they were intact. These additives are often marketed with a time lapse slide show showing that the product “disappears”. What they don’t show you is the toxicity in the soil afterwards. Again, since most landfills are designed for nothing to degrade, anyone making a claim of “landfill degradation” is probably bogus and needs to do more homework on what actually is happening in landfills. In the final analysis, it is well known that petroleum is not a sustainable or renewable resource. The Earth will run out of it, so we need alternative technologies. The CO2 released from petroleum products is carbon that has been stored since long ago. The CO2 released from the degradation of PSM is carbon that has been recently pulled from the atmosphere so you have a much more healthy cycle. The petroleum companies really have nothing to worry about because there will be plenty of demand for petroleum in the foreseeable future. My son and I put together the z-axis today. Watching a 4 year old use a hack saw was amusing – I kept it safe and he felt like it was the best thing in the whole world. The elevator is supported by 4 screws, using flanged nuts connected by L shaped aluminum extrusions. The screws float between the upper and lower cross beams – RC car bearings prevent them from binding. Sprockets and chain from Electric gold mine tie it together. In order to tension the chain, I added an additional sprocket which I can move along another crossbar. I designed the z-axis so that I can replace the print surface. I spent quite a bit of time the last couple of weeks working on a feeder and heater for the extruder. I figured this was going to be the hardest part of the build; and was right so far. My first attempts at feeding the filament were with a screw. It turns out that the filament is too slippery to grip with any certainty. This may work for granules, but for filament I think I need something else. One design I’ve seen for commercial extruders uses a feed roller. From sdp-si.com, I ordered a feed and grooved idler. Hopefully the urethane roller will engage the plastic better than the feed screw. I’ve been experimenting with various methods of heating the extruder head to melting temperatures. While I managed to not catch the house on fire or electrocute myself, I failed to achieve a decent heater. Electric Gold-mine was offering a “NASA heating element” on sale. It has micro-coiled nichrome wire in an electrically insulated package. In the process of determining what this device actually was, I found Clayborn Labs – a company that makes heater tubes and tapes. The configuration of the heater tube is perfect for the extrusion barrel. I’ll be working to finalize specifications this week and will be ordering a 1 off prototype along with a thermostat – both together are actually less expensive than what I’ve spent so far on the extruder barrel! My first approach at decomposing an object to voxels, then to generate primitives from this “voxel space” may not be the best algorithm. I’m finding that I use edges to discover if a voxel is set, then during reconstitution need to find edges. I’m worried about curve detection – Sketchup has context if an edge is part of a curve. Not to mention that it takes an hour to “voxelize” a small simple object…I still believe that locating sub-volumes is the correct approach for the path generator, but moving forward I’m going to look into using the edges themselves not voxels. Stay Tuned. I was discussing the prospect of “home fabricators” with a reluctant friend of mine recently. The idea that a “3D printer” would be as ubiquitous as Microwave ovens in 10 years may seem far fetched. I likened the hobbyist nature of home fabs today to the garage computers of the ’70s. The device I’m building is like “Lego meets the Easy Bake Oven”.One of the oft mentioned complaints of using Fused Deposition Modeling (FDM) for toys is that you end up with a highly aliased volume – it has ridges. And while ridges are fine for potato chips, they aren’t very good for toys; or so they say. The smallest of Lego have a dimension of about an eighth inch – an order of magnitude larger than an FDM modeler. The voxel generator is complete. 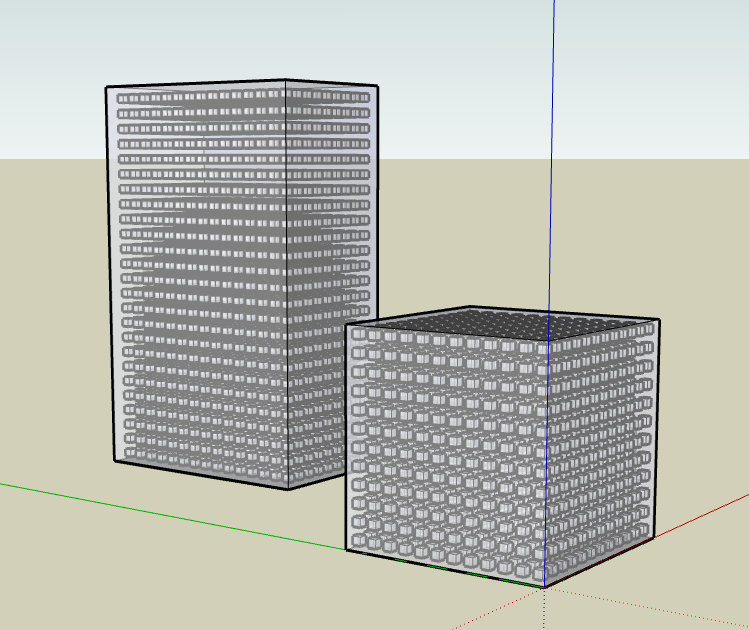 I spent quite a bit of time attempting to use Sketchup’s intersection APIs in order to build voxels; only to discover that Sketchup doesn’t maintain volume information – just edge information.The current implementation of the voxel generator uses a guillotine to slice the model into layers. For each apparent voxel, it uses a line crossing point-in-polygon algorithm to determine if the voxel is set. This code doesn’t handle curves yet – sketchup represents curves differently than simple edges.My next step is build composers – which walk the voxels to generate specific objects. These will be used to generate layer commands which will be sent to the motor controller. You are currently viewing the archives for March, 2008 at OoeyGUI.